Helumoa 3-D Light Shows: Free Waikiki Entertainment! 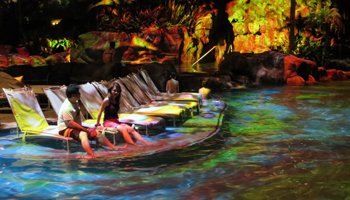 To help you visualize this new and unique Hawaii vacation attraction, I’d say the Helumoa light shows are comparable to the Fremont Street Experience in Las Vegas… without the stiff neck… and underwater… and right next to beautiful Waikiki Beach. Okay, maybe they’re not that similar. Nevertheless, just imagine digital animations of erupting volcanoes, ocean life, hula dancers, wave riders, Waikiki Beach hotels, and more. Then project these images onto rocks, plants, deck chairs, and the bottom of a 200,000-gallon swimming pool. Add music, sound effects, and tiki torches. 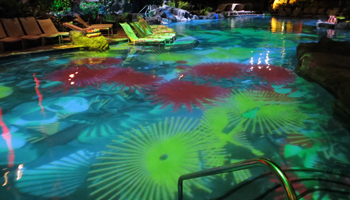 Then you’ve got Helumoa – the newly-created free Waikiki attraction that the Sheraton Waikiki hotel bills as the world’s first permanent 3-D pool mapping light shows! Spectators are welcome even if they aren’t staying in the guest rooms at the Sheraton. However, you must be a guest to play in their pool before and between shows. Whether walking in from the beach or off the street and through the lobby, you need to get to the “Helumoa Playground” beachfront pool area on the southeast side of the Sheraton tower (facing Diamond Head crater). There are two beachfront pool areas at the Sheraton Waikiki. Make sure you go to the correct one. It is reported that there are two different shows; and each runs for approximately five minutes. The 8pm show is about the birth of the Hawaiian Islands from the first lava rising up out of the sea to highlights of native Hawaiian culture. I’m told that the 9pm show is supposed to be about the story of Waikiki from ancient surfing spot to the early days of Oahu tourism. Unfortunately, I can’t confirm this second show, because when I went, they played the first show twice. Go on a Friday night. Walk down the beach to the Outrigger Reef Hotel where you can watch the Waikiki fireworks at 7:45pm. 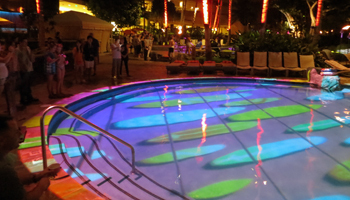 Then if you hurry, you can make it back to the Sheraton Waikiki for the 8pm Helumoa light show. Or you can enjoy some leisurely time on the beach and make it back to the Sheraton in time for the 9pm show. Go get some drinks and pupus (hors d’oeuvres) at the adjacent RumFire beachfront restaurant (outside seating, of course) and enjoy some light shows with your libations. Go for a refreshing (possibly romantic) walk down Waikiki Beach. If your timing is right, you can catch one show on the way out and the other as you return.